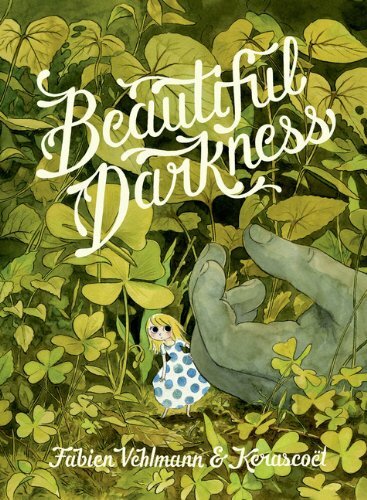 Written by Fabien Vehlmann and wonderfully illustrated by Kerascoet, Beautiful Darkness is published by Drawn and Quarterly, which also brings other comic gems like “Louis Riel” and Guy Delisle’s series of travel comics. The book was originally published in French. “Beautiful Darkness” is a strange morbid comic of Aurora, the protagonist, and her community of tiny people who live inside a dead body. It’s a dark fairy tale, and almost feels like a twisted mixed version of Thumbelina and Lord of the Flies. Aurora is first seen to be having tea with her Prince before having to escape - out of a decomposing little girl’s corpse. The story unfolds from there, and starts to delve deep into the loss of innocence and cruelty, somewhat uncommon in most comics. Aurora is sweet, yet she can be vicious. Some of her friends like Marie are completely devoid of empathy for others; Marie casually orders a mother to be buried inside a pencil case (because she looks different) and abandons the baby. I finished reading the comic in one sitting, intrigued by the escalating plot. While it made me quite uncomfortable, I could not help wanting to read more and finding out what would happen next. The comic is illustrated deftly with pencil and watercolour - from the forest animals to the lush forest backgrounds. The characters are designed with Disney-like big eyes and simple lines. This creates a much bigger impact and makes the story very surreal when the characters are involved in various cruel acts. The comic panels and story flow are very well thought out, making the comic a page turner. I highly recommend this book for its unsettling fairy tale and gorgeous watercolour illustrations.